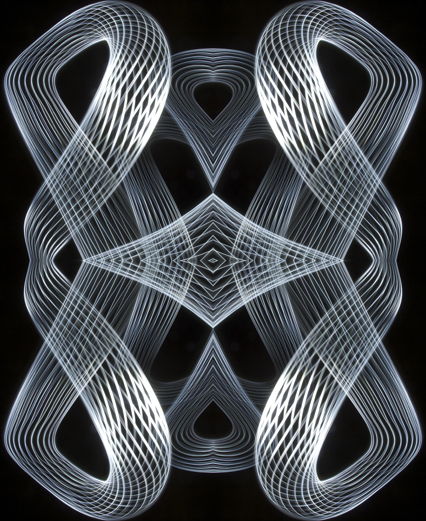 With well over 45 digital layers and sections, plus several hours in photoshop, Tower of Light No.1 is one of my more complex drawings made with light. All the drawings were created in the air and recorded with my tripod mounted Nikon D700 digital SLR. The exposures were made in the dark with a 8mm lens and ranged from 1.5 to 4 seconds at f22. Kinetic Art, a form of art that depends on movement for its effect. 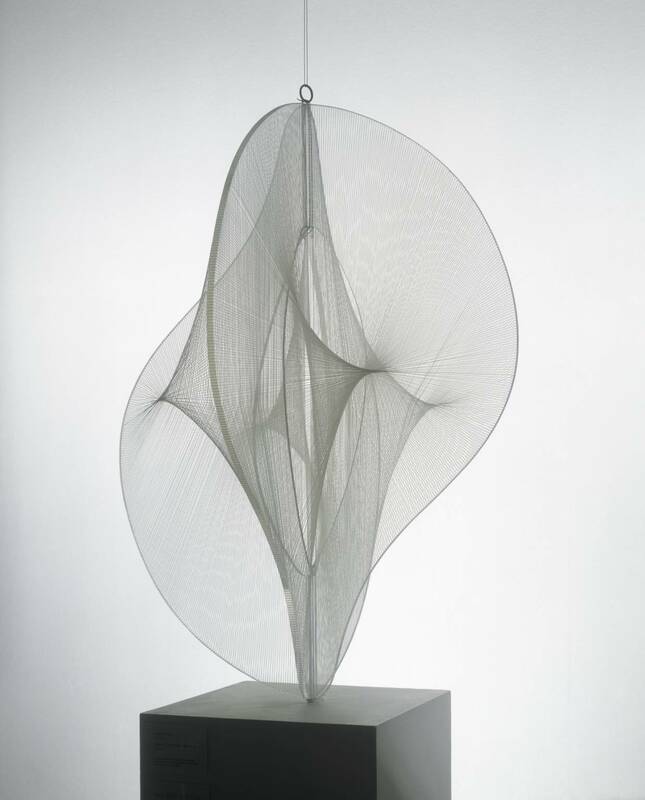 The term was coined by artists Naum Gabo (1890–1977) and his brother Antoine Pevsner (1886–1962) in 1920 and is associated with the mobiles of artist Alexander Calder. The above definition is from the Apple dictionary. You could argue that all art depends on movement to some extent, having to move and guide the pencil or paint brush across the surface to create the artwork in the first place, or having to walk round a sculpture to view it fully. When the wind stops moving the freely hanging sections of a Calder sculpture, does it cease to be kinetic art? I consider my work Arial Dance No.1 to be kinetic art because it is a photograph of the process of three dimensional creative movement captured over time. 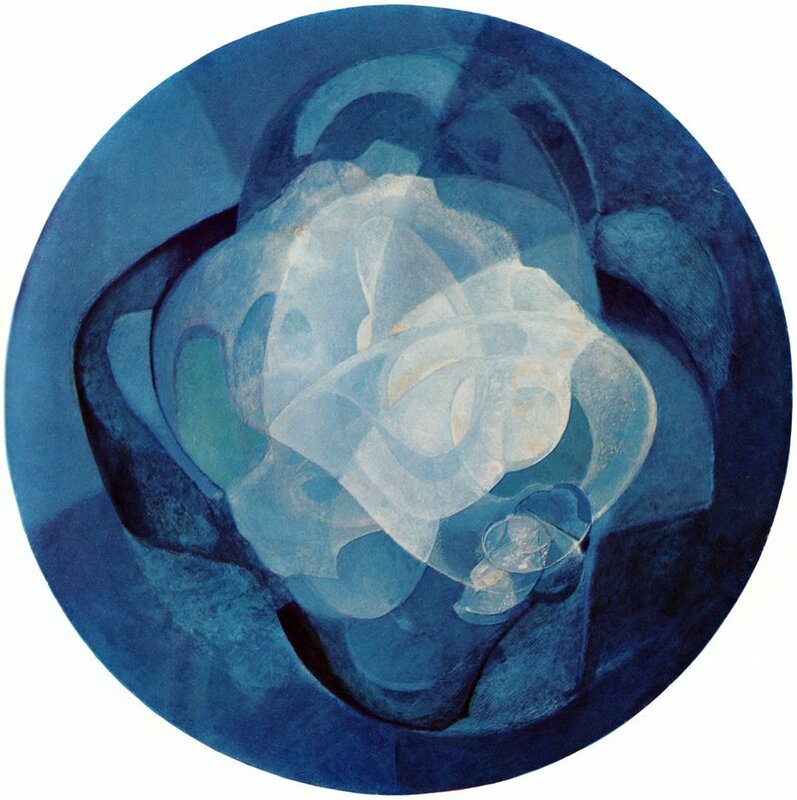 The painting above which has a hidden motor behind it was designed by Gabo to be viewed in motion. When the motor is turned on, the painting revolves, making one rotation every two minutes. I have admired Gabo since being an art student in the mid 1960s. His wonderful sense of form, space, and inventiveness has been very inspiring. 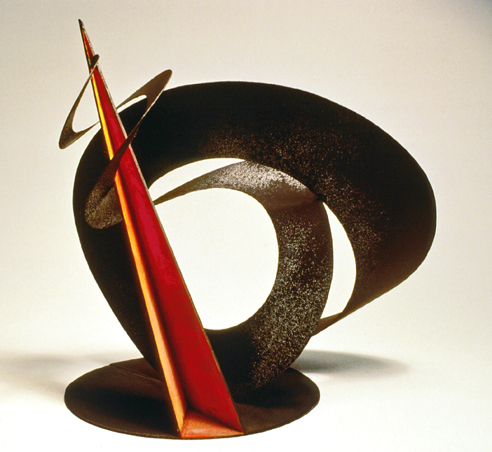 Here is one of my earlier sculptures that was partly influenced by Gabo. It depicts two kinds of movement, that of spiraling (the black section), and the movement of a rocket taking off (the red section). Although this piece is about movement, I do not consider it kinetic art, but it does take the movement of the gallery viewer to walk around it. Not sure if Gabo considered this work of his as kinetic, but it certainly has a feeling of movement, reminding me of the series of photos of the famous American dancer Martha Graham with her flowing costume taken by Barbara Morgan. 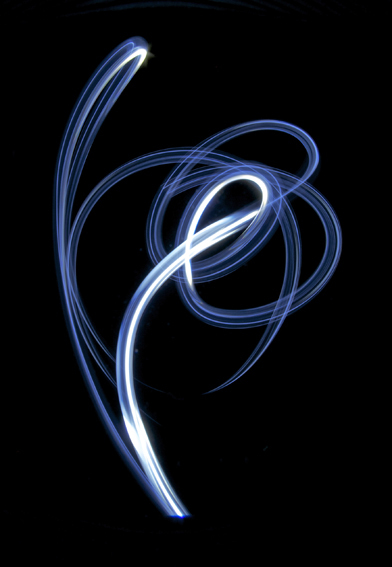 There is a wonderful fluidity that can be achieved by drawing with light on a large scale. The process is part drawing and part dancing in three dimensions, and not with just one hand. I often use both hands to draw with, plus lights can be attached to your feet, although I have not tried that yet. 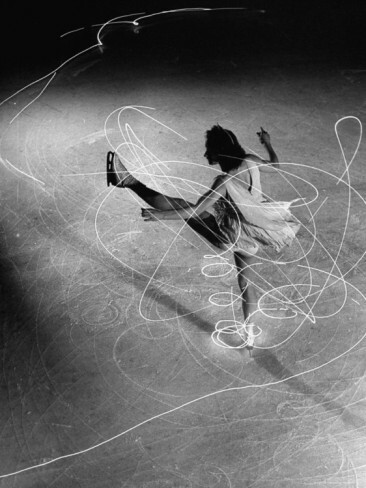 Gjon Mili experimented with the effect of trailing lights in the 1940s, when he attached small lights to the skates of ice skater Carol Lynne. The luminosity of line drawn with some kind of light source is hard to achieve in any other medium, other than stained class. 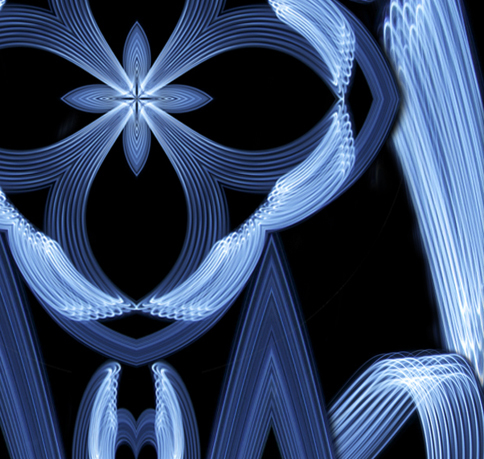 The process of making a mandala with light feels very theraputic and sometimes spiritual. They relate to the look and feel of some of the stained class windows in the ancient churches where I grew up in England. The landscape was taken with a Nikon D70 mounted with a 28-105mm lens, on a trip to Scotland, shortly before I was attacked by two huge swans. Did not realize how big and dangerous swans can be! It’s always a good idea for photographers to carry bread to appease them. I managed to escape with both my life and camera. Luminarta Mandala No.2 was painted with several LED lights and created with 20 digital layers and sections. 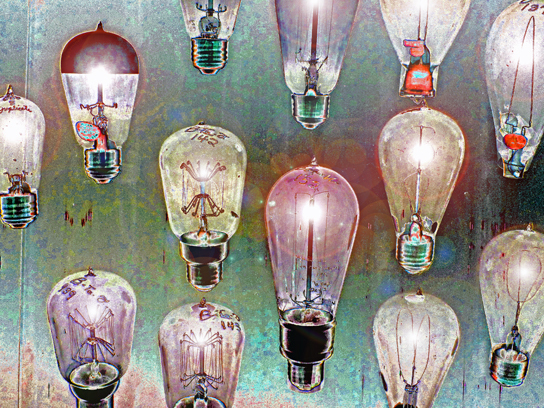 My medium is light, and after taking a photograph of some vintage light bulbs, I decided to bring them back to life. It was a chance to experiment with some of the photoshop digital filters and effects, including solarization, glowing edges, and flare, which made the bulbs appear to light up. I also used contrast and lighting controls for post production. This is the original photo that I took on my Nikon D200 digital SLR with a 28-105 mm lens. 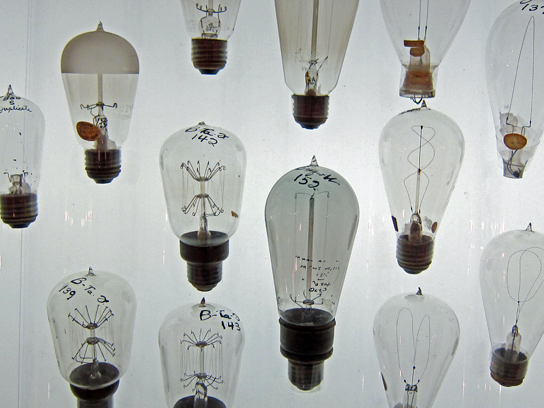 The bulbs were backlit. 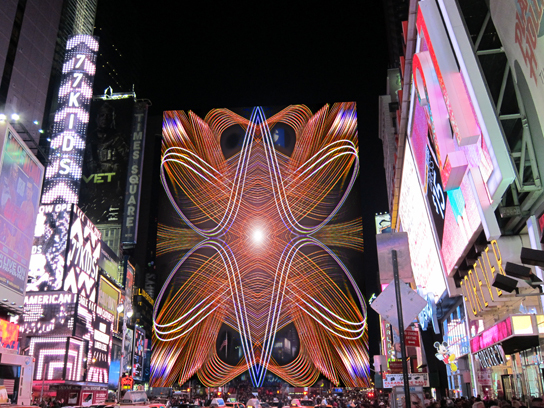 Times Square seems like an applicable place to have a Mandala made of light. It is the place of lights after all, and maybe those New Yorkers need something to meditate on , a bit of art therapy to calm their frayed nerves. My mandala was a lot smaller when I painted it in my studio, but it was painted in the air using different LED lights in both hands, and recorded on my Nikon D700, using a 28-105 mm lens. I took the picture of Times Square on my small Canon S95 in the middle of the square, and it was so bright that I did not need a tripod. 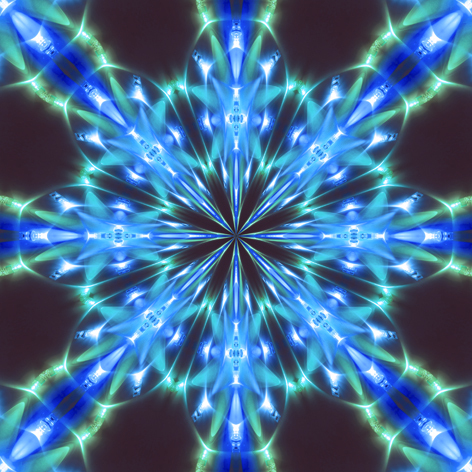 Luminarta Mandala No.1 was created with 88 LED lights arranged in formation. 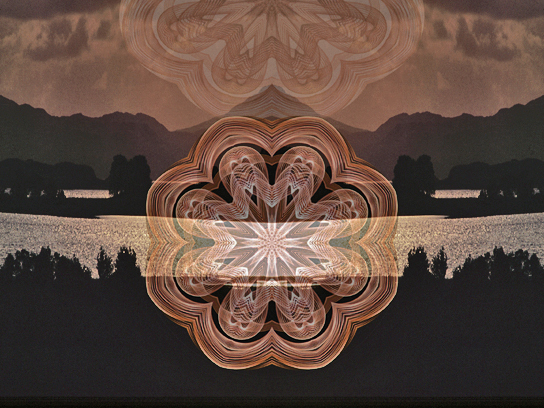 I completed a quarter of the design, and repeated it digitally in photoshop to achieve the finished mandala. Art is long and life is short, so if I can save some time by using photoshop, I will often do so. Working digitally is a huge benefit and gives you many options of filters and effects, but I tend to be very careful in which ones I use. It was recorded on my Nikon D700 with a 28-105 mm lens. The exposure was 1.5 seconds at f22.